While personally, I think some of the options to be on the upper scale of power, generally these glitches are by far outweighed by the cool ideas and content and the rather distinguished, unique fluff of the setting. The Ley lines especially offer potential galore. 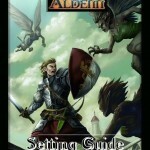 I am really hard-pressed to judge how to rate this particular pdf – On the one hand, I absolutely loved a lot of the content and Mor Aldenn actually came to a logical life in my mind – this by one who abhorred the player’s guide and thought that it made no sense, by the way! On the other hand, there are some crunchy bits that are unbalanced, some wordings that could be slightly more precise and there is some reprinted material. Due to these minor issues, I can’t bring myself to rating this campaign setting the full 5 stars, but I’ll settle gladly for a final verdict of 4.5 stars including a seal of approval. Your mileage may vary whether you’d round up or down. Due to the low price of only 5 bucks for more than 100 pages of material, though, and due to liking the fairy-tale like, truly magical atmosphere, villains with unique abilities etc.pp. of the setting, I’ll round up. Just please be aware of the rough edges I mentioned in this review.